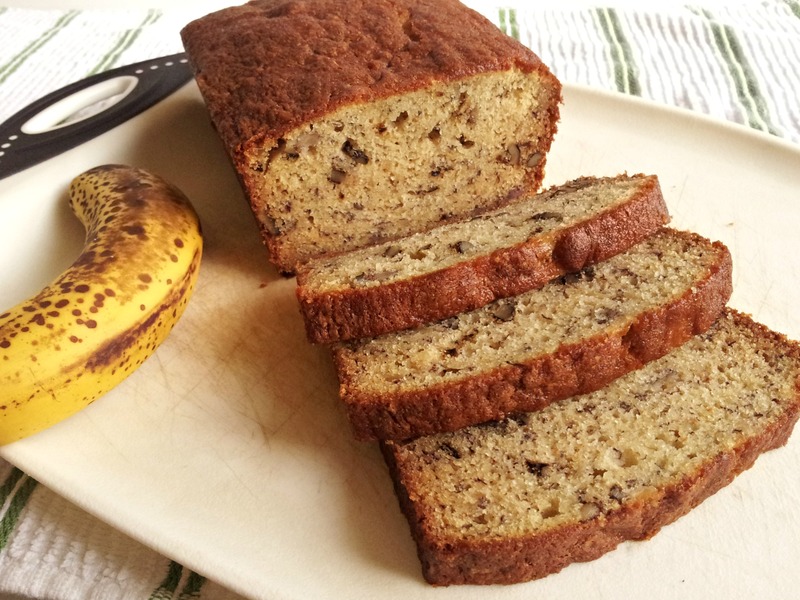 Verdict: This banana bread is moist, light and full of banana flavor – duh, right? I like this type of recipe that doesn’t add spices that mask the flavor of the banana. I did add toasted walnuts to mine because I like the crunch and texture it gives to the finished loaf. Also, I doubled the recipe because I had so many bananas, plus the container of sour cream had the perfect amount left for it. Mine took about 50 minutes to bake using the convention setting on my oven. Whenever the smell of what is baking becomes really noticeable is when I start to check it. Thanks for reading, enjoy! Banana Bread – adapted from Eat Yourself Skinny! Preheat oven to 350 degrees F. In a stand mixer, or hand held, mix together softened butter and sugar until well combined. Then add in eggs and mix well. Next add in vanilla, sour cream and mashed bananas then, while the mixer is on, slowly add the flour, baking soda and salt and mix slowly until completely combined, scraping the sides and the bottom. Meanwhile, grease your pan(s) and lightly flour so that your bread won’t stick. If using one 9×5 loaf pan, bake bread for about one hour. It looks delicious! Mom is going to try making it.